Many years ago, all the birds of the world gathered to decide which of them would be the king of the birds. After many days of debate, they decided that they would hold a contest. 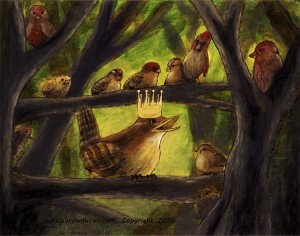 Whichever bird could fly the highest would be the king of the birds. On the day of the competition, all the birds took off into the air. The small song birds quickly tired, their fragile wings unable to carry them far. They were soon joined by the ducks, crows, and many others. In short order, only the strongest of the eagles still climbed into the sky. This eagle climbed higher and higher, until the last of his competition gave up and returned to earth. He smugly congratulated himself, and began his descent. He was exhausted from the competition, and needed to recover. As he was falling, he heard a small bright voice above him calling “I am king! I am king!” It was the little brown wren, fluttering above him. She had carefully, quietly, hidden among his feathers, and ridden his back into the sky. The eagle was furious, but he was too exhausted from the competition to fly higher. When the wren landed the small birds cried in joy and surprise. They were sure that one of the larger birds would win the competition, but had been too afraid to complain. The large birds were furious. “You only won through trickery and cunning, and that’s not fair,” they complained. “Eagle would have won through strength and brawn. Why is that better than cunning? If you have your doubts name another challenge and I will win once more,” the wren replied. The large birds were furious, and decided that the wren could be the king, but she would never rule them. They each took turns standing guard at the hole, waiting to kill the wren if she tried to climb out. Days passed, and wren stubbornly remained in her hole. One night, the owl was guarding the hole, watching the wren with large yellow eyes. When the morning sunlight peeked over the horizon, it momentarily blinded the owl. The wren saw this as her chance, and quickly escaped from the hole. The little brown wren is still the king of the birds, but she is so afraid of the eagles and hawks that she stays hidden in hedges and bushes. They will kill her if given the chance, as they are ashamed that she won their competitions. All the other birds visit her for advice, as she is so clever and cunning. This story is based on a traditional folktale from the British Isles. 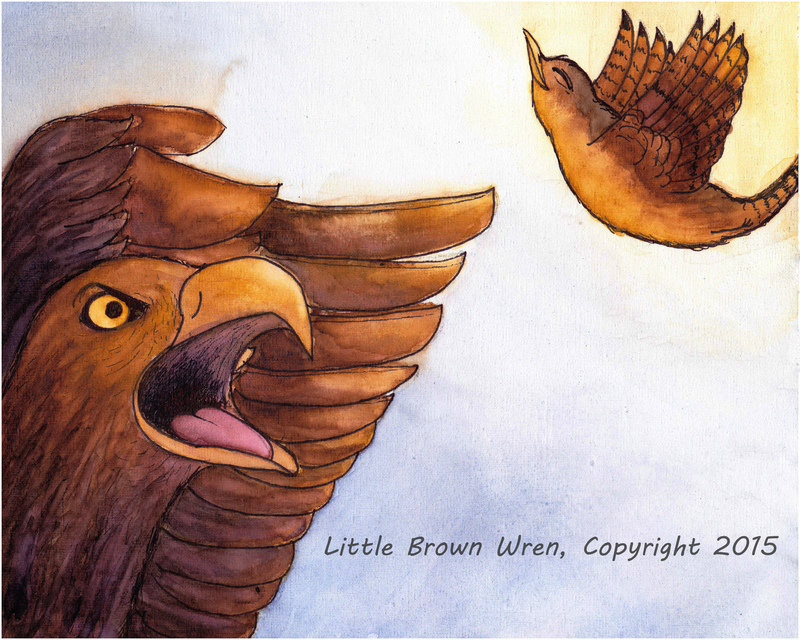 The wren is a small brown bird, commonly referenced in Celtic folklore, and symbolizes life, energy, and cleverness. On December 26th, the feast day of St. Stephen, it was traditional to hunt the wren. The bird would be placed on a decorated poll, and paraded through the village. In modern times a fake bird is used, and the day is celebrated with music and dancing. The wee Wren is my spirit bird. Shy, careful, yet very clever. She hides in my bushes, seeking out the seeds I’ve put there, just for her. She’s lovely! So special! I await her arrival every wintertime, and I’m always SO happy when she arrives. I often, at first, mistake her for one of my many chipmunks, she resembles them so. By the time they have gone to ground, The Wren is happily taking the seeds I’ve strewn. I welcome her arrival! It makes the cold weather MUCH more tolerable! Thank you for your comment! Absolutely–I love them!